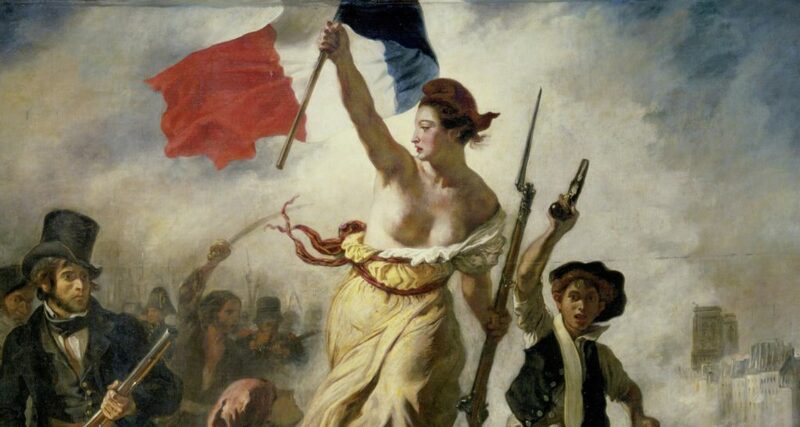 For Bastille Day (July 14), let us take symbolic tour of the French Revolution. The French Revolution of 1789 is often billed as “the birth of modern politics” and the Jacobins who took it over “the first modern political party.” Indeed, they shared more than a little in common with the Bolsheviks who took over Russia in 1917. It wasn’t enough to have a regime change; both the Jacobins and the Bolsheviks felt they had to remake their respective countries from the ground up. There came to be a “revolutionary” way of doing everything! In this way did the the French Revolution differ from the American Revolution that inspired it. For the Americans to dissolve the political bands that tied them to the British crown was psychologically easy enough, given that 3500 miles of ocean separated the two; the Americans adopted a new flag and national emblem, and rejected anything monarchial, but left pretty much everything else about their society intact. The situation was rather different in France, given that the government, and its numerous supporters, were all right there, and ready to make alliances with neighboring powers hostile to the revolution. Thus there was a greater imperative to extirpate everything associated with the ancien régime, through terror if necessary. Allegorical female figures. In Latin (and in French), most abstract nouns are feminine, so it is easy to imagine “Justice” or “Hope” as female figures. The revolution saw the increased use of these – the idea was to avoid saints like Joan of Arc, Louis IX, or Denis. The seal of the First French Republic (1792) featured “Liberty”; in 1830, Eugène Delacroix painted Liberty Leading the People (see below). Eventually a female figure representing France acquired the name “Marianne” and is now an integral part of French symbolism. A young woman is even elected as a model Marianne on a regular basis by all the mayors of France. She’s everywhere! Eugène Delacroix, Liberty Leading the People (1830), detail, via Wikipedia. 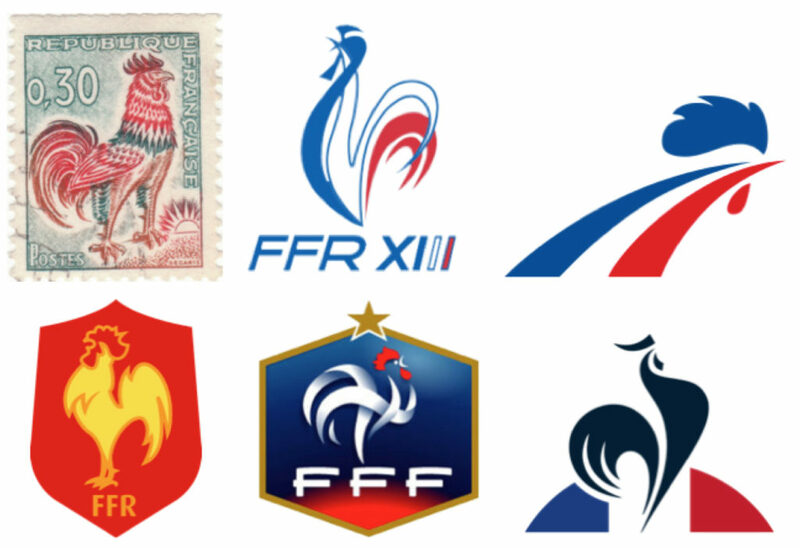 Bleu-blanc-et-rouge. I understand that the French tricolor actually dates from the early days of the revolution, when people thought that a constitutional monarchy was still possible. White was the Bourbon color, and red and blue the colors of Paris, so the idea was that the three colors represented an alliance between the monarchy and the citizenry. The three colors survived the execution of Louis XVI, however, and as a cockade identified the revolutionary National Guard. A tricolor flag of vertical stripes soon followed. It has been France’s national flag continuously since the July Monarchy of 1830. Tympanum of a state-owned French church, via Wikipedia. Seal of the First French Republic, 1792. From Clip Art Etc. Fasces and Phrygian cap. These were two more revived classical symbols beloved of the revolutionaries. A fasces consists of a bundle of rods bound around an axe. It was a ceremonial object borne before the consuls in republican Rome, and is thus a symbol of republicanism (although it isn’t as popular as it once was, given that it’s also a symbol of fascism). The Phrygian cap was worn by Phrygians and others in the ancient Near East; through confusion with the pileus, cap worn by freed slaves in Rome, it came to be a symbol of freedom. Marianne wears one, often with a tricolor cockade; sometimes the cap is shown lifted aloft on a pole. Inscription (1792-1794) on a church at Ivry-la-Bataille, via Wikipedia. Cult of Reason. Nothing better illustrates the anti-clericalism of the revolutionaries than their sponsorship of the Cult of Reason as a replacement for Roman Catholicism. Churches across the land, including Notre Dame in Paris, were transformed into Temples of Reason, and a national Festival of Reason celebrated on 20 Brumaire Year II (see “Revolutionary Calendar” below). As the name implies the religion was dedicated to the pursuit of philosophy, and the object of its worship was “the people.” This was too much for everyone to stomach, and Robespierre himself sponsored a competing Cult of the Supreme Being, which at least acknowledged the existence of a god of sorts. After Napoleon’s concordat with the Catholic Church in 1801, he banned both cults. Le Panthéon national, via Wikipedia. Panthéon. Another aspect of the revolutionaries’ anticlericalism was their expropriation of the church of Ste. Geneviève in Paris and its transformation into a mausoleum for national heroes, such as Voltaire and Rousseau. 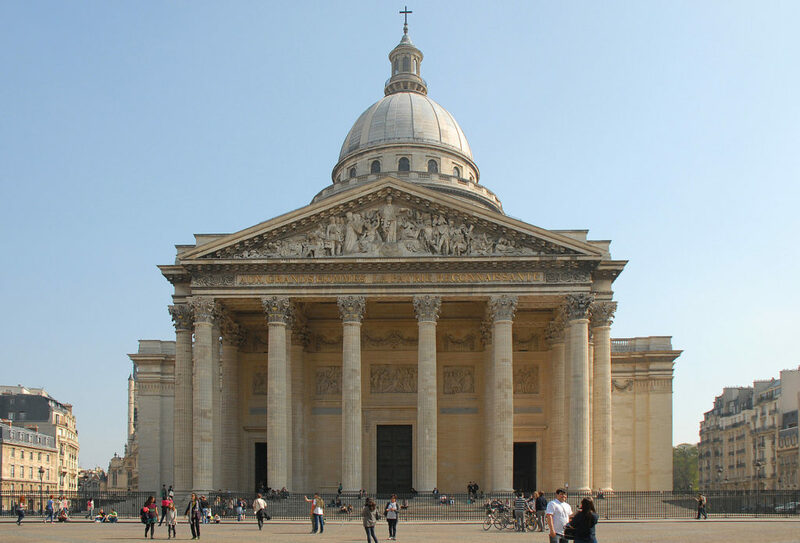 This Panthéon (a nice classical reference there) has reverted to being a church on a couple of occasions and a cross remains on the dome as a memento of the building’s original purpose, but it is still in use today as a secular French hall of fame (the most recent interments were in 2015). Foucault’s Pendulum, proving the rotation of the Earth, was first demonstrated in the Panthéon in 1851. A map of the départements of 1798. From Liberty, Equality, Fraternity: Exploring the French Revolution. Départements. The thing about the ancien régime is that its traditional geographical subunits (Aquitaine, Burgundy, Brittany, etc.) were also the titles, and private fiefdoms, of various dukes and counts. Such particularism, and anything smacking of aristocratic privilege, could not be welcome in the new France. So the revolutionaries divided the country into 83 départements, each one to be governed by a civil servant known as a prefect and each one named, neutrally, after a local river or some other geographical feature. The capital of each département was to be no more than a day’s ride from any settlement in it, as a security measure. 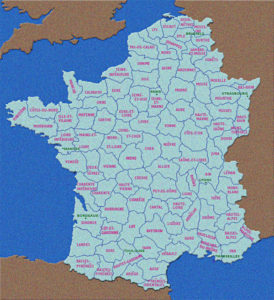 It remains the fundamental administrative division in France, even if people might still claim to be from “Champagne,” “Normandy,” or some other traditional area. 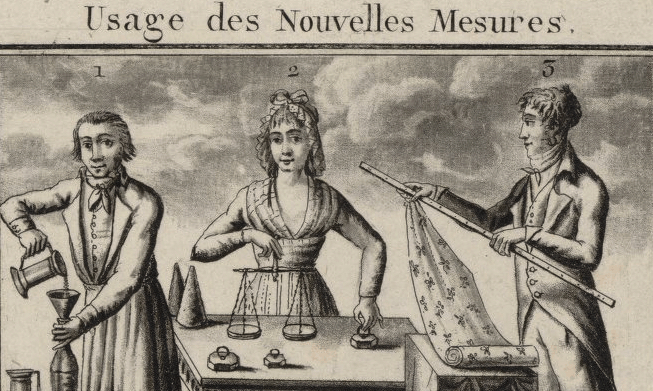 “Use of the New Measures,” woodcut from eighteenth century France (detail), via Wikimedia Commons. 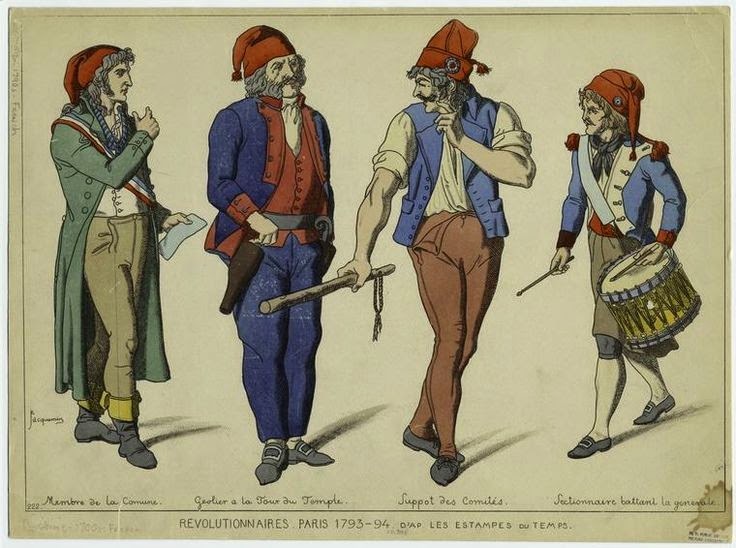 Personifications of the autumnal Revolutionary months of Vendémiaire (“vintage”), Brumaire (“mist”), and Frimaire (“frost”), from Journal d’un Ségoleniste. Revolutionary Calendar. 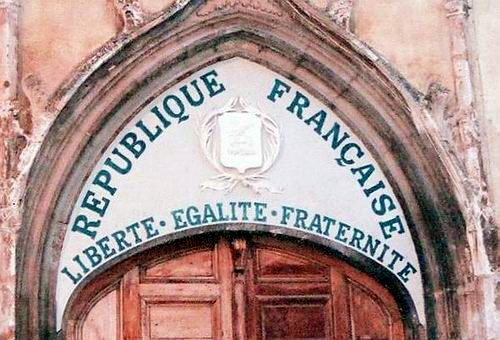 Like revolutionaries everywhere, the Jacobins claimed they were living in a new era, and designated 1792, the year of the abolition of the French monarchy, as Year One. They also reorganized the calendar so that there were twelve months of thirty days each, with an extra five or six intercalary days dedicated to revolutionary virtues like “talent,” “labor,” or “honors.” Every other day of the calendar was dedicated to a fruit, vegetable, animal, or tool, and the months themselves were given descriptive names like Messidor (“harvest,” June-July) or Nivôse (“snowy,” December-January). No longer would people be celebrating the saints’ days of the old calendar! This innovation did not stick (Napoleon revived to the Gregorian system in 1806), although the names of some of the months live on, as in Lobster Thermidor, Emile Zola’s Germinal, or Karl Marx’s Eighteenth Brumaire of Louis Napoleon. An interesting website has more information, and a calendar converter. 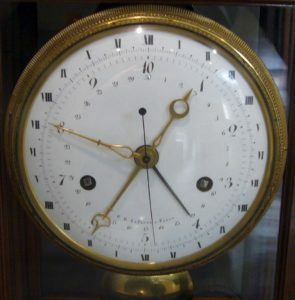 French decimal clock from the time of the Revolution, via Wikipedia. Decimal Time. This one was even more bizarre. That there are sixty seconds in a minute, and sixty minutes in an hour, and twenty-four hours in a day, was displeasing to some people. Metric is based on powers of ten, so the revolutionaries sponsored a decimal system of time measurement whereby each day had ten hours, each hour had 100 minutes, and each minute 100 seconds. This was deprecated in 1795. Guillotine. Everyone knows about this instrument of the Reign of Terror (although it was only one of several methods of execution that the Jacobins employed). The irony is that the guillotine was actually considered humane, and a social leveler to boot. 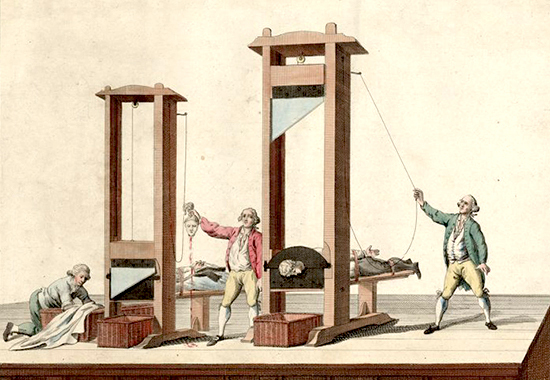 In the ancien régime, commoners got hanged, while only aristocrats were entitled to decapitation. The trouble is that often the hanging victim did not die instantly, while the executioner of nobles sometimes required several sword strokes to finish the job. The guillotine was not going to miss, and provided an instant, painless death no matter what social class you were from. It remained the preferred method of capital punishment in France until the abolition of the death penalty in 1981. From “Tweedland,” The Gentlemen’s Club. 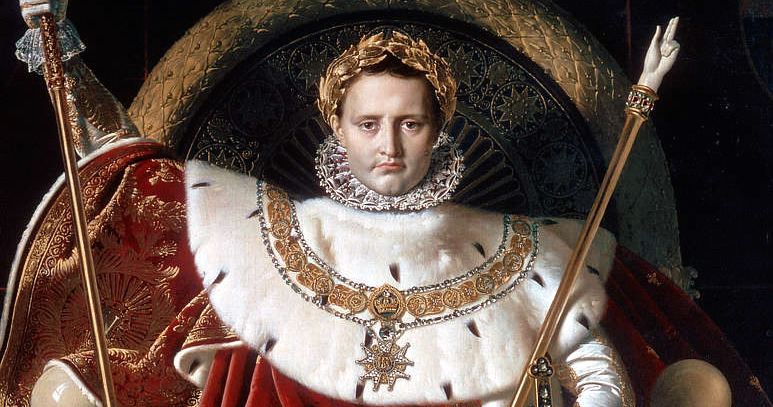 Jean-Auguste-Dominique Ingres, Napoleon I on his Imperial Throne (1806), detail showing collar of the Legion of Honor, via Wikipedia. Legion of Honor. This was a Napoleonic innovation, meant to replace the chivalric orders of St. Michael (1469) and of the Holy Spirit (1578), sponsored by the French monarchy. The Légion d’honneur, in good republican form, was meant to recognize talent, merit, and achievement, not birth. It has survived all subsequent vicissitudes of French politics and remains the pinnacle of the French honors system. From the blog of 98.7 WFMT. The Marseillaise. This song was composed in 1792 after the declaration of war against Austria and declared the revolutionary anthem in 1795. It derives its name from a group of volunteers from Marseilles who sang it as they traveled to Paris. You know the tune – it opens the Beatles’ “All You Need is Love,” strains of it are heard in the finale of Tchaikovsky’s 1812 Overture, and it is played by the man with the tape recorder up his nose in the Monty Python sketch. The lyrics are pretty violent – the enemy is coming to “slit the throats of our sons and companions,” so we must fight back and “let an impure blood soak our fields”! It was deprecated by Napoleon and banned by the nineteenth-century monarchs, but restored to official status in 1879 and remains France’s national anthem. Jean-Pierre Houël, Prise de la Bastille (1789), via Wikipedia. 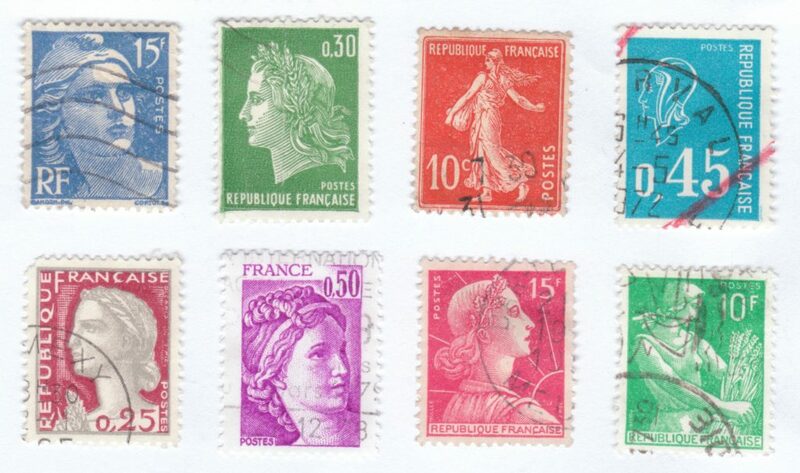 Finally, there is Bastille Day itself, or as the French call it, la Fête nationale. There were many events in the fateful year of 1789, including the convocation of the Estates-General (May 5), the Tennis Court Oath (June 20), the Great Fear (July-August), and the Declaration of the Rights of Man and the Citizen (August 27). But the one that everyone remembers, and that stands in for everything else, is the Storming of the Bastille on July 14. The Bastille was a prison in Paris that had come to symbolize royal tyranny, and following the dismissal of the reformist Finance Minister Jacques Necker on July 12, the Parisians stormed it. Ninety-eight attackers and one defender died in the battle; afterwards, the governor of the Bastille had his head removed and paraded around on a pike. The prisoners – none of whom was actually political by that time – were freed, and the building quickly reduced to rubble. The elevation of July 14 to its current status of premier national holiday came about in 1880, in the early years of the Third Republic. I do not know why this event of all that took place in 1789 became so important – I guess, as with the Marseillaise, that violence shows you’re serious. UPDATE: I suppose a better reason is that the destruction of a physical barrier, like in Berlin on November 9, 1989, is psychologically satisfying. 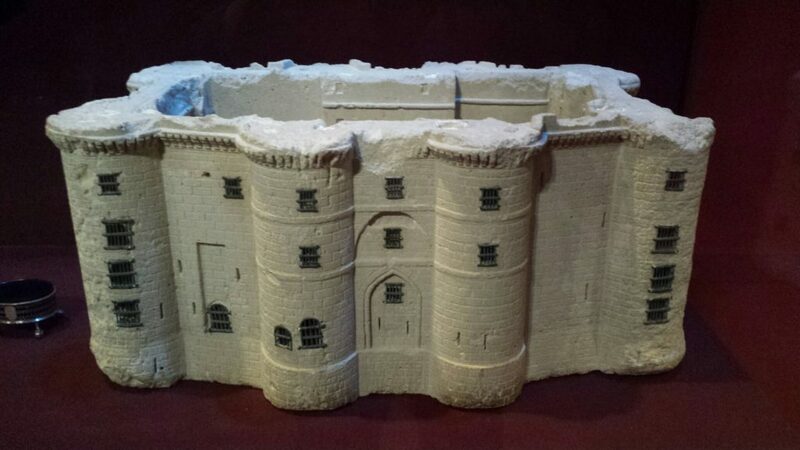 Here is a photo of a model of the Bastille, made from one of the bricks of the Bastille, presented to Washington by Lafayette, on display at Mount Vernon. This entry was posted in Anniversaries, Eighteenth Century, France, Revolution, Symbolism by jgood. Bookmark the permalink.